Once again, thoroughly entertaining, and is fast becoming one of the best events around. The Museum is excellent, lots to see, and a superb Meccano exhibition, these guys are clever ! You should see the superb detail, and engineering, in these fantastic models they create. 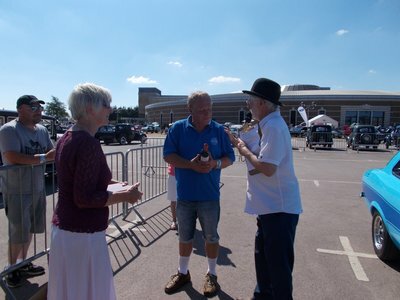 Lovely weather, and lots of good company, as usual, all helping out, under the watchful eye of our Bob Wilkinson. He’s so good at organising, unlike me, I can’t organise, something, in a brewery, ask Sandie ! On the Saturday I met up with Jim Miles, in his Y, and me in my CX, at Waltham Abbey, then Roger Corti, in his Y on the A 41. Then a good run up to Gaydon. What a hot day ! But all three cars ran well, in spite of the heat, pretty much as usual, they just keep going. I clocked about 270 miles round trip, Jim similar, and Roger a little less I guess. ​A bit of a laugh to say the least, as is usually the case when we three get together, life is too short to be serious ! Saturday night saw the three of us having our usual calorie controlled fry up, and some laughing juice, (beer) to wash it down. We sit there for ages, putting the world to rights, and lots of silly banter, again, no change there. 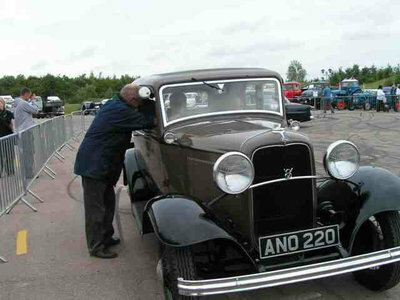 ​Sunday, up early, and ready to ‘marshall ‘ in the visitors’ pride and joy - all Fords of course - and the stands for the auto jumble. I picked up a radiator for my CX and E93A, (£15), as I don’t have a spare, and you never know. I will have it checked and re cored if necessary, plus a few other odds and ends. It was pleasing to see some of our members, seeking me out for technical advice, charging problems, etc, etc. Sunday, even hotter than Saturday, up in the high 80’s ! then farewell’s to all, and a long and uneventful drive home. A good weekend ! and thoroughly enjoyable. Thanks Bob, and everyone. ​Once again, the OFR welcomed more than five hundred old Fords (pre-1990), many between 50-100 years old! Included was a 1920’s Model T Railways Inspectors Car running on a short length of track, with rides given! 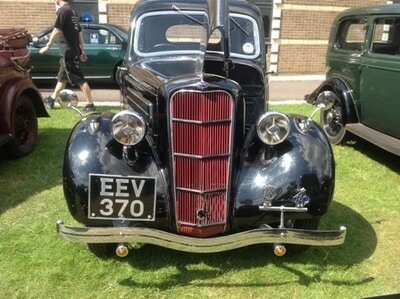 ​Whilst the weather was not at its best, nonetheless, visitors were many and enjoyed a vast display of Ford cars along with many Autojumble stands ( primarily Ford parts.) Visitors also got to see inside the newly expanded Heritage Centre of the British Motor Museum and that included a fantastic Meccano exhibition and various trade stands inside. Upstairs was also an Antique Penny Slot Arcade, fully working with old pennies . 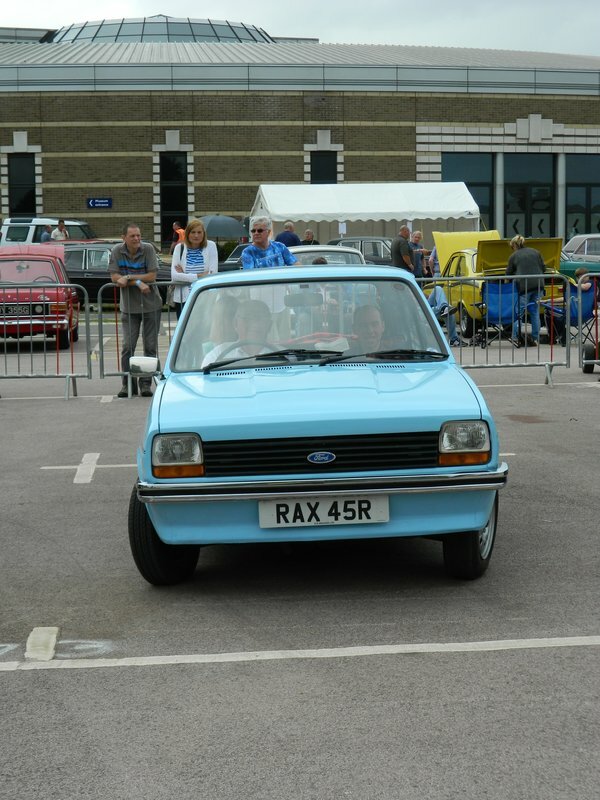 Of course, WP4335, the Short Rad Model Y was also on display in its Garage Workshop and was revisited by many members, including myself, Jim Miles and Dave Tanner. 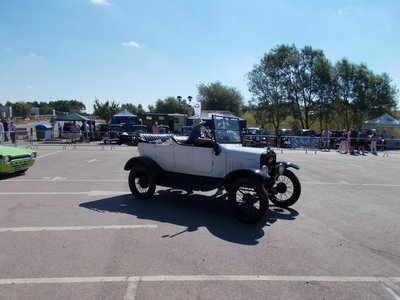 ​Much building work on the grounds was noticeable, reducing some car parking area this year, but with the promise of an even bigger and better show in years to come. 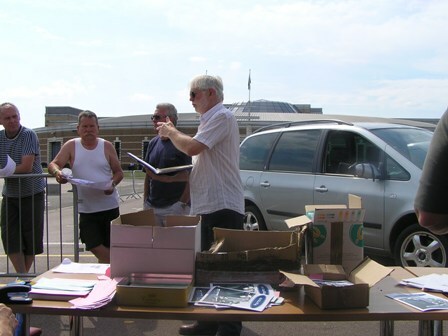 The team of committee and members, with many wives too, under the powerful leadership of Bob Wilkinson, soon had the pamphlet distribution organised along with numerous stewards quickly and efficiently showing guest cars to their various locations with their clubs or types. 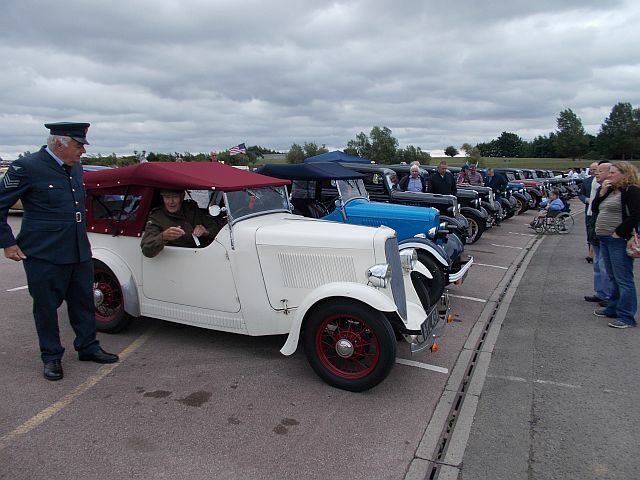 An arena area later showed off Military display, specials and prize winning cars, alongside Young enthusiasts and interviews. 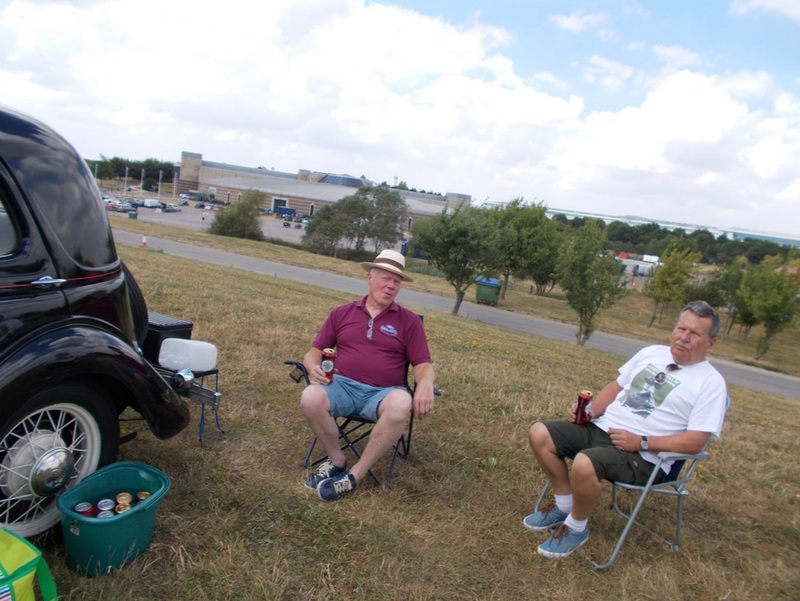 Many members managed to bring their Model Y’s and C’s along to make a distinct feature area where visitor interest was high, and many questions answered. 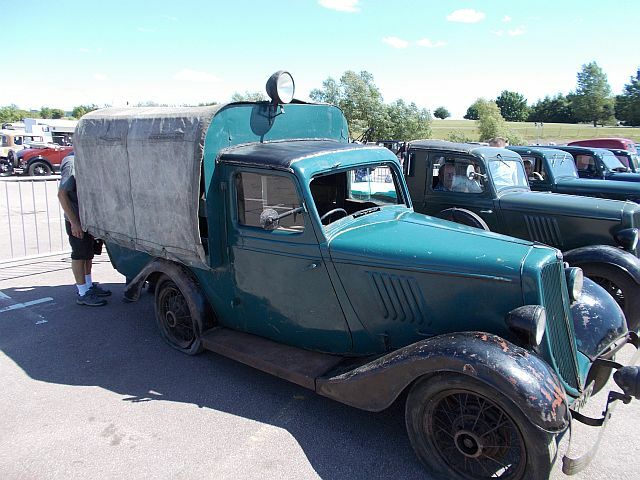 Here were ten Model Y’s, two Model CX’s , one Pick up and a tourer. 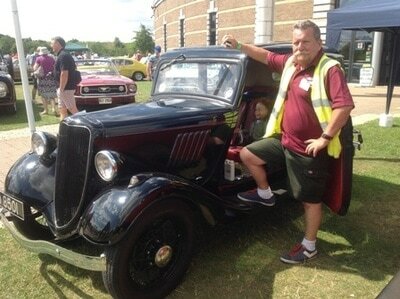 Amongst our visitors was Steve Whitley from Rochfordwith his CX , EEV 370, that had recently been one of three CX’s in a retro show in Rochford. Winner of Commercial vehicles was: First - Dave Deadman in his 1948 F1 Stepside Pick-up with flathead V8, second was Ian Bartlett in his 1940 E83W with nicely sign written “Cox’s” , bought twenty-nine years ago. 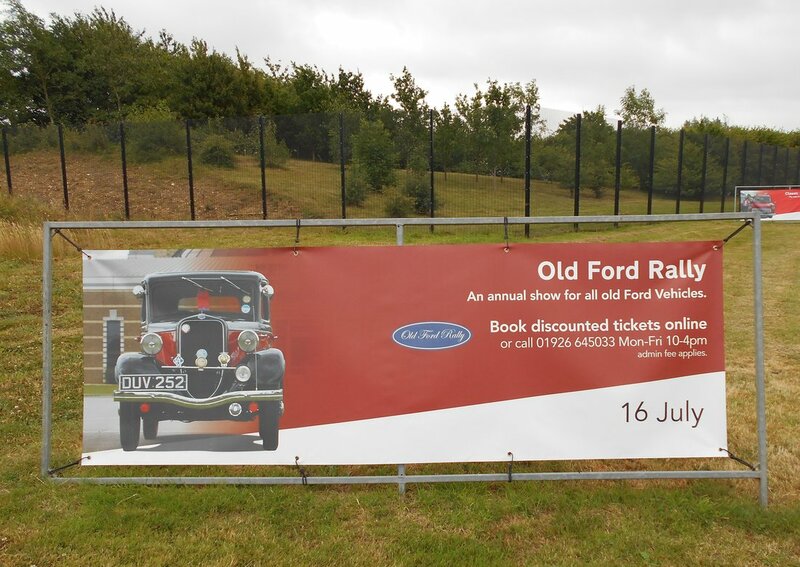 The Old Ford Rally, Gaydon - Sunday, 17th July 2016. 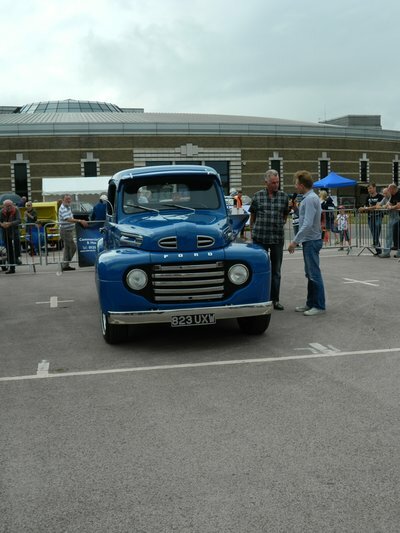 Once again, members who attended the Old Ford Rally, held at the British Motor Museum, Gaydon, would have enjoyed a superb collection of over 500 old Fords. 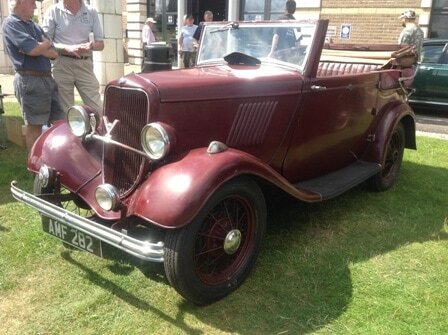 Cars and vehicles dated from around 1911 through to 1990, including those from about twenty classic car clubs. 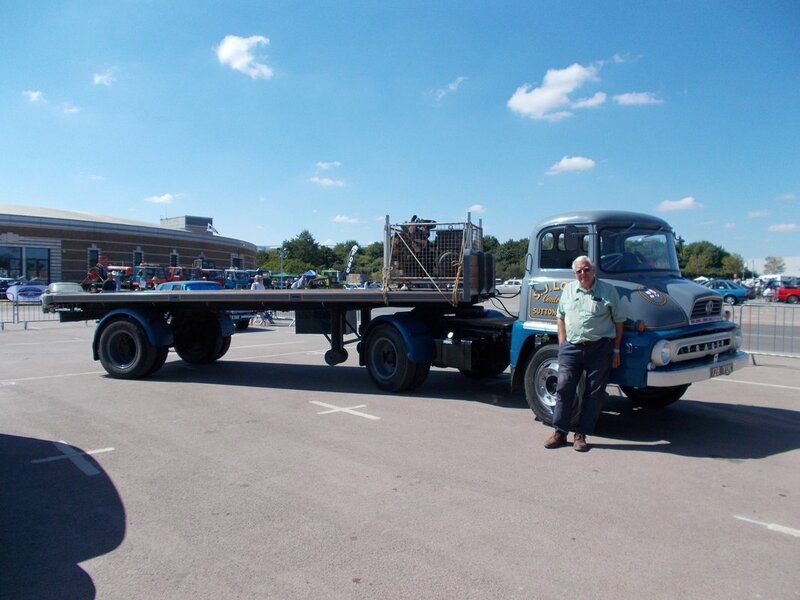 An increased number of autojumble trade stands – these having an excellent selection of parts that with the additional space provided to them, provided buyers with spacious displays. Many bargains were enjoyed! 2016 was the 40th anniversary of the Ford Fiesta and the 50th of the Cortina Mk 2! 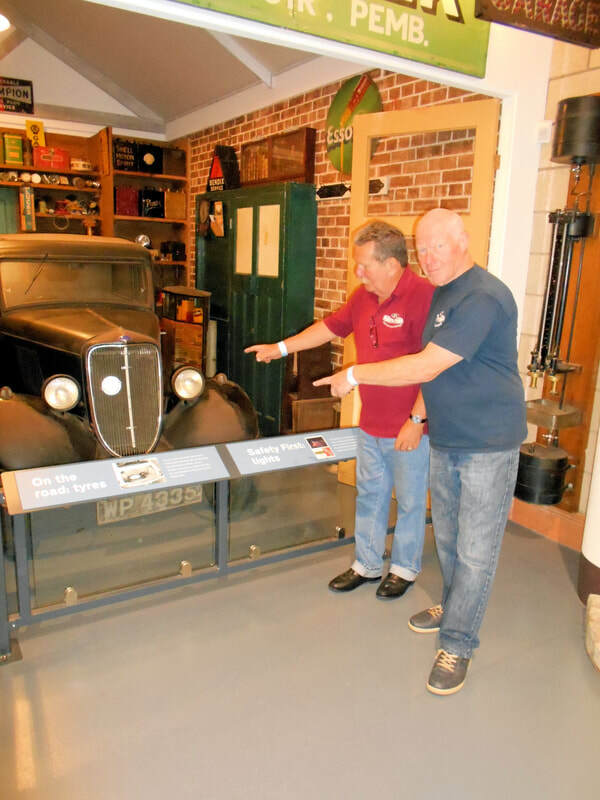 Within the newly expanded facilities of the BMM were found Mecanno displays, Penny Arcades and a Minic Motorway car layout – besides the excellent museum vehicle display, Collections Centre and workshops together with a Film theatre. During the day, within the arena could be seen a Military parade and special features, interviews and displays with Tom Watson our enthusiastic commentator. Visitors also enjoyed a quiet moment observing the Model Boat Club demonstration on the lake alongside. 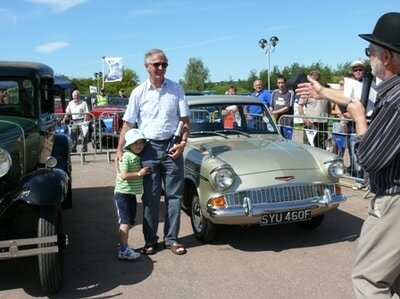 Awards as usual were selected by visitors votes of “Vehicles I would like to take home” as submitted. 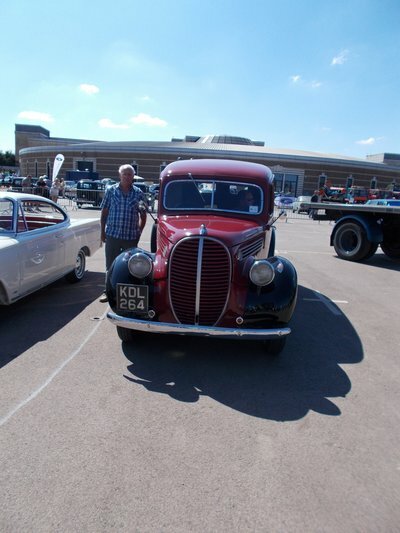 The Old Ford Rally, Gaydon - Sunday, 19th July 2015. If you didn’t attend this event, our 6th Show, you missed a truly great event! 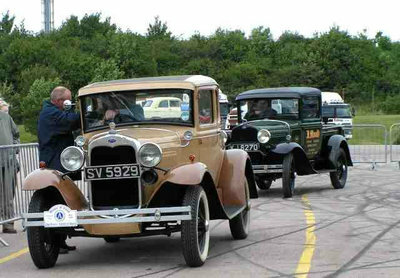 Organised with continuing care by our Bob Wilkinson together with several other Classic Ford Clubs, it ran as smooth as one could wish, providing spectators with a truly superb show of historical Ford cars. 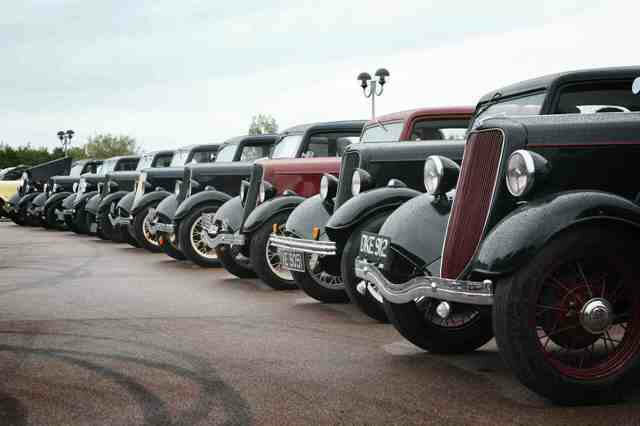 Between 5 and 6 hundred pre-1990 cars from twenty Ford Clubs attended, many getting on for a hundred years old. This year saw the CX have its 80th anniversary and the Mustang its 50th. 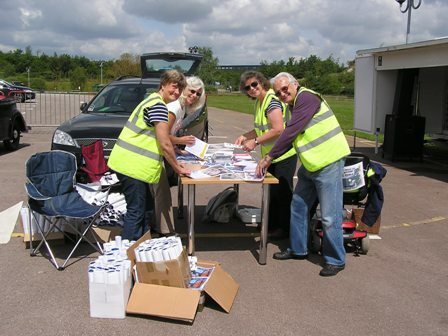 Saturday saw the team come together, along with those from the Heritage Centre, to get signs placed, barriers moved and a vast quantity of advertising material and voting slips sorted and placed into bags to give away as freebies to entrants. All the team kept lubricated with teas and coffee and fed a continuos supply of cakes! ​From our Y & C Register, we had about twenty plus cars attend, mostly driven there, showing off their reliability and proving the loving work and care of their owners. 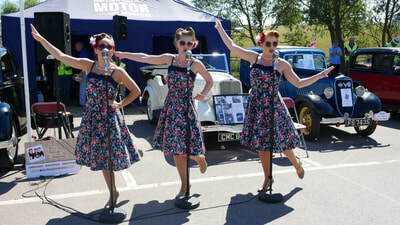 ​The show was themed around the 1945 wartime 70th anniversary and many braver members dressed up in accordance with those memorable times, in varying ranks of military splendour. Cars even dressed in wartime blackout outfits with white edging and blackout headlamps. I’m told that Graham Miles’ rifle was quite safe! 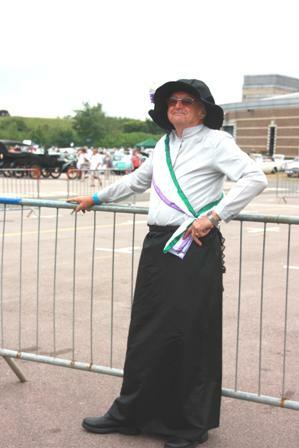 Member Ladies were also splendidly dressed as well as the Gents. The Military Vehicle Trust and Bicester Home Guard attended, putting on special displays and parades. ​Members present included Arthur Redfern , who had been driven down from Cheshire by Eddie Partington. 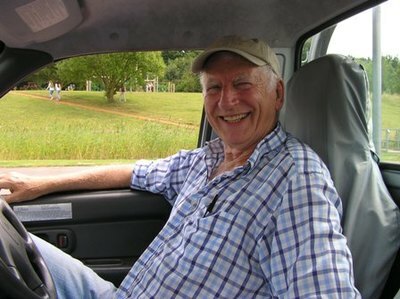 Arthur had sold his CX to Andrew Bailey once too old to drive. Ladies were thanked by Bob for their help with Kath Samuel, Joan Sharpe, Pat Wilkinson, Elsie Malyon as well as Penny and Lorraine Jarvis. 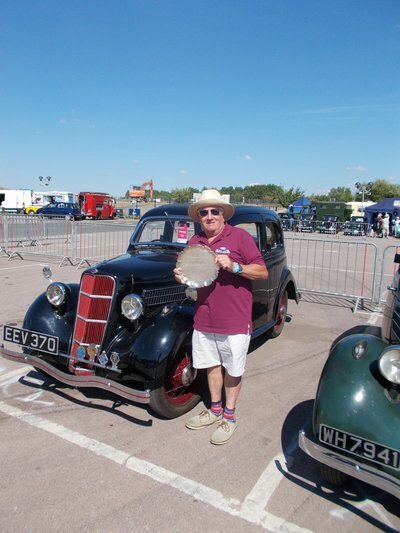 Awards voted by the public were given out, as well as Ian Hawley winning the Bert Thomas Award from our club for Best Car. That being presented by our Chairman, John Argent. Many members attended – too many to list in full, but included Graham and Barbara Powers from Eastbourne, Geoff Salminen, Jim Miles, Geoff Dee, Colin French & Penny, Nigel Stennett-Cox, Ex-Treasurer Bruce Allen, Sue & Nick Smith, William Nutty, Ian Hawley, Eddie Saunders, Frank Johnson, Graham Miles, John Argent and many others - whose names my notebook and memory omitted! 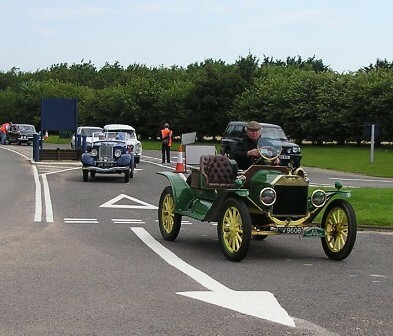 Clubs that worked together with the Gaydon Heritage Centre to bring you this show were the Ford Capri Int, FSOC, Ford Model T register and ourselves in the Y & C Register. 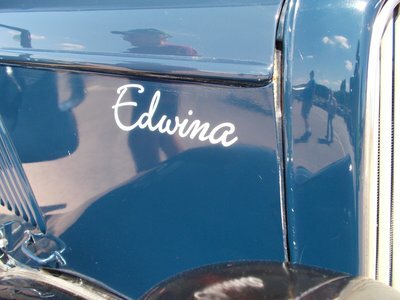 ​A survey of members cars was taken observing the number that had our car badge adorned, and this was just 8 out of 19. Perhaps put on your Christmas Present List? 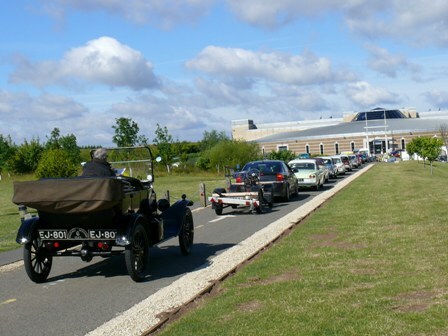 ​I am pleased to report another successful – the 6th – Old Ford Rally at the Gaydon Heritage Centre. Visitors were able to view around 600 classic Fords from 1911 to 1990, see displays from 20 clubs and rummage through a large area of Autojumble and trade stands. In addition visitors could visit the museum and film theatre with enthusiasts waiting and willing to talk to them. 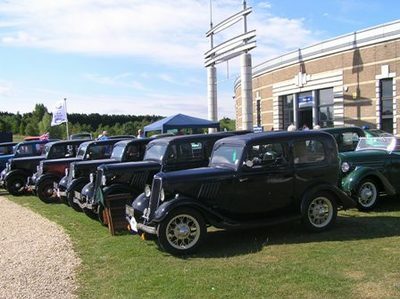 Organised by four clubs – The Capri International, The Ford Sidevalve Owners, The Ford Model T Register and ours – the Ford Y & C Model Register - together with the Heritage Motor Centre, the show lived up to the high standards of previous shows. 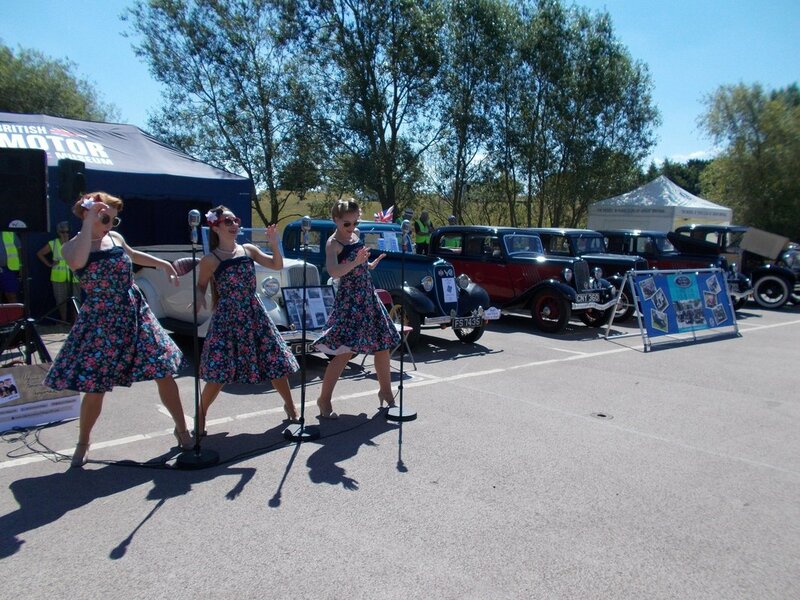 The weather was kind to us (if not a little too hot on the Saturday whilst we prepared). 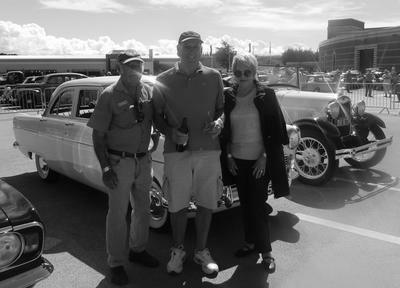 Visitors were in good number as were the age and variety of the cars and commercials. John Mould was again well represented, as were many other interesting commercials. Autojumble stalls were again brisk with many bargains sought. 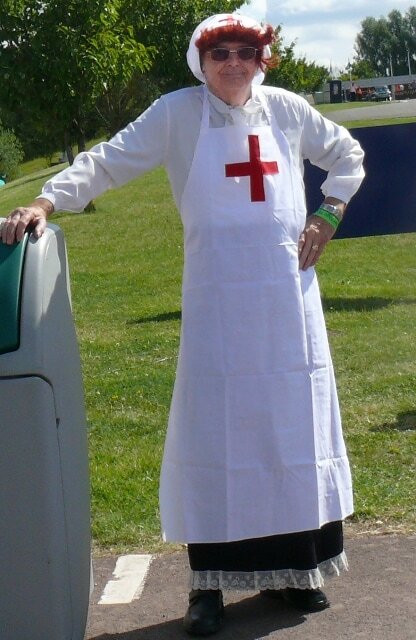 The theme this year was the centenary anniversary of the start of World War One, with our ‘girls’ dressing up as nurses of the period. (See inside rear cover) The Last Post was broadcast at eleven o’clock as a reminder, along with a few appropriate words by our Bob Wilkinson. 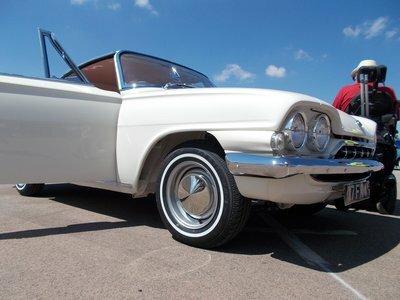 ​About twenty of our cars were on display (and all bar a couple were driven there! ), making a formidable contingent, situated just to the right of the main entrance, so commanding much attention. Our Sam Roberts sat in his gazebo busily trying to sell copies of the book. (Have you got yours yet?) 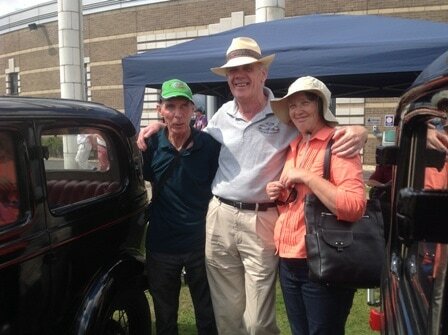 Sam met up with visitors Derek and Jenny Bone from the Blue Mountains of New South Wales, Australia. Jenny owns 'Blue', the youngest known surviving short Rad, which she exported to Oz from UK and which was the subject of the bush fires reported in Transverse Torque last year (issue 205). We feature Jenny’s car on the rear cover of this magazine. 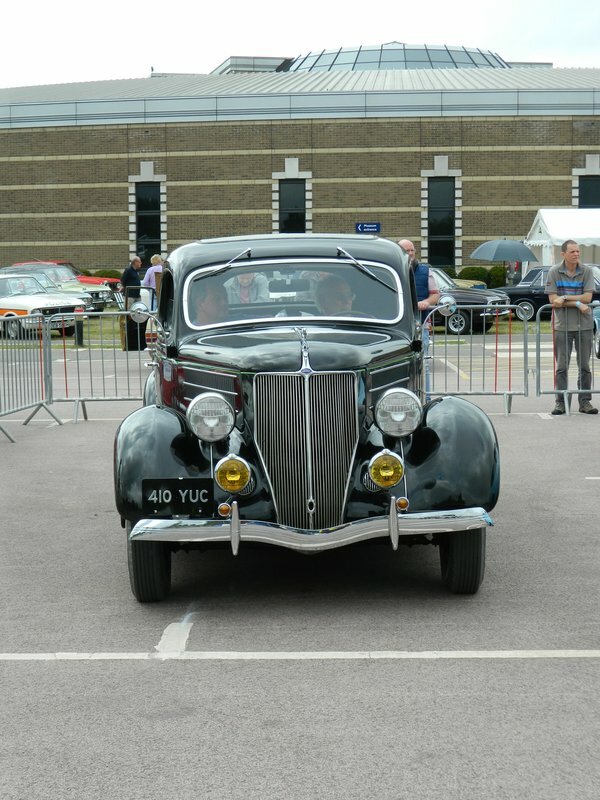 Many other discussions on our cars occurred especially with the striking attendance of Graham Cribb & David Dowsett’s newly renovated CX tourer. 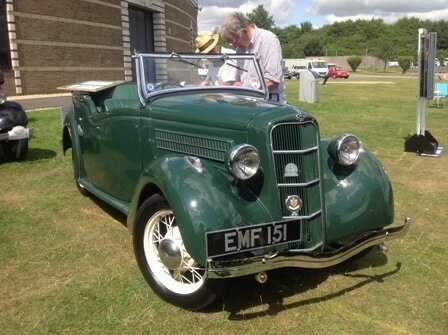 The OFR is a wonderful opportunity to see ‘under the bonnet’ of members cars and compare, suggest and ask questions. The Cairn was like a honeypot to members! 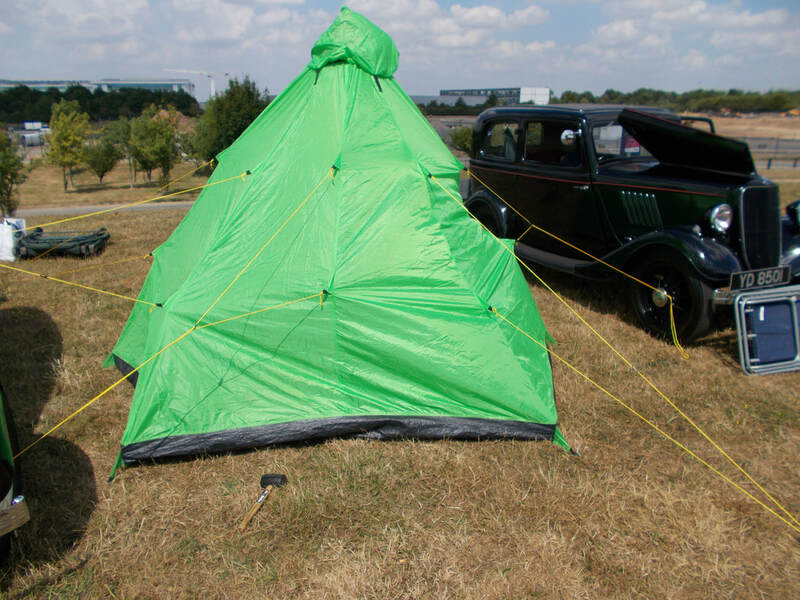 ​We also had the pleasure of YD 8501 - Jim Miles’ Model Y – comments being made that when it rains he takes his Eifel tourer, and in the sun and heat he brings the closed in Y! His little friend though was in attendance, amusing visitors somewhat, but not too talkative. ​The Club’s prize for the Best Club car on show went to Andrew Bailey and his well finished 4-door CX saloon - CAU 392 The engraving soon to be added to the excellent trophy plate he received from our Chairman John Argent. 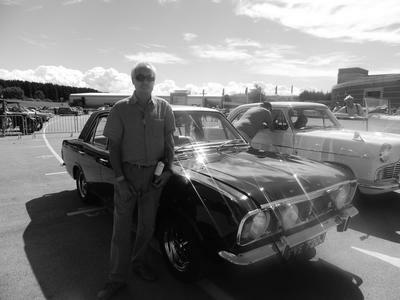 ​The Show Car winners voted as “The car/commercial you would like to take home” were Adrian Evans and his white 1969 MK2. 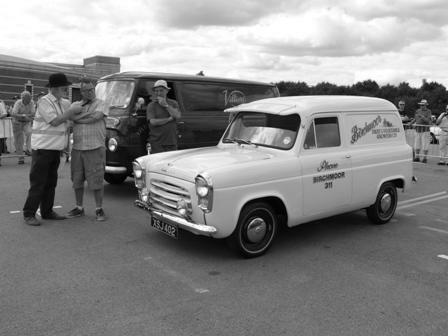 Cortina 1600E with runner up Neil Kinkinson and his yellow 1979 Capri 3.0S Best commercial was Paul Gollings and his red 1959 Thames 400E van with runner up Dave Carden and his cream 1958 Thames 300E van. Bob Wilkinson presented prizes to the winners. The Saturday night before had brought some fun and frolics in the manner of a barbecue around the Roger & Jo Hanslip’s caravan. This proved a great ‘get to know you once again ‘ opportunity. Photos were shared of the progress on Roger’s Y Van. (Coming along nicely), Penny French, due to her recent knee operation, had the benefit of Vicky acting as her nurse. 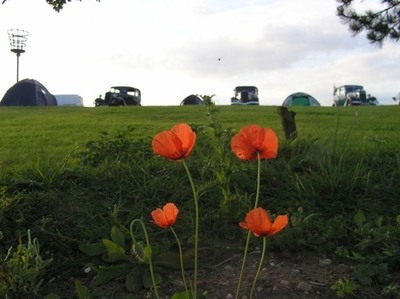 A few of us had camped (properly in tents!) and greatly appreciated the new buildings, layout and shower block provided by the Heritage Centre. Things just keep on improving there! For myself – and probably reflecting other’s thoughts – the event proved most enjoyable in the camaraderie of members, the superbly finished cars on display, the fun of driving my Y 180 odd miles and the friendly contacts made and refreshed. I for one am looking forward to next year there! 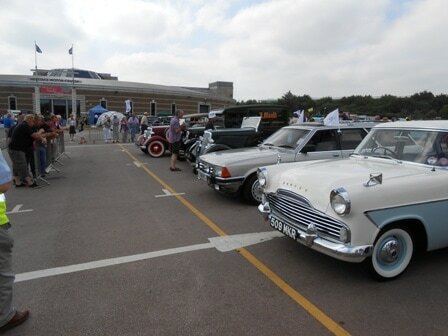 The sunshine was late in coming on Sunday, 21st July 2013, the day of the Old Ford Rally at Gaydon in Warwickshire. But it arrived eventually, adding extra warmth to the day. 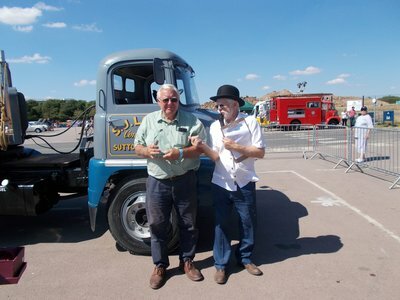 Not that it was needed, as the warmth from the friendliness of members and visitors alike, together with the passion of all the participants – Clubs, Autojumblers and the Heritage Museum staff - kept the fire of enthusiasm well alight. 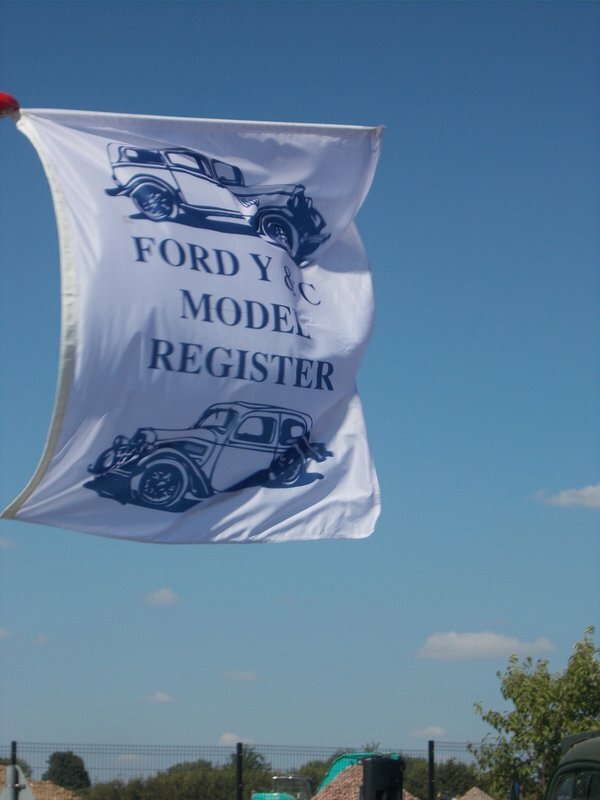 Organised by the co-operation of the Model T Register, The Capri Club (Mansfield), The Ford Sidevalve Owners’ Club and our own Y & C Register, the day just got brighter and better. 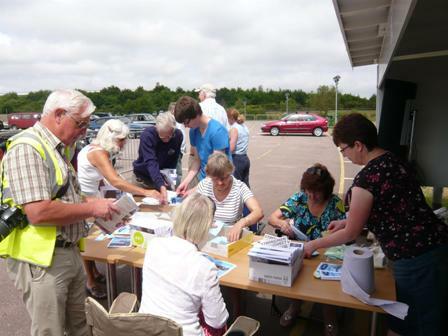 Club members and Committee had arrived to prepare on the Saturday and soon were beavering away in an organised but chaotic way, inserting the voting slips into the programmes and then packaging up adverts and information into “Goody Bags” for the expected hundreds of visitors due on Sunday. The club display areas had to be organised and measured out with appropriate lollypop signs and barriers. The Autojumble fields too were carefully measured and marked out and an afternoon meeting was arranged to demonstrate the various and coloured twizzle sticks and signs needed to shepherd the visiting cars and exhibits. Tasks were delegated, timings noted, incidents prepared for and maps/layouts were confirmed. The tastiest of cakes were amply provided over the weekend, provided by Jo Hanslip and Pat Wilkinson and were duly sampled (diets ignored). Amongst Saturday attendees were Jim and Joan Sharpe, Clive Harrison and his son, Benjamin, Mike and Elsie Malyon, Penny Stevens and Colin French, Lorraine and Robert Jarvis, Gary Whittle and Victoria Edwards, Pete and Jean Ketchell, Roger and Jo Hanslip, Geoff Dee, Geoff Salimen, Nick and Monique Smith, Herbert Wingate, Jim Miles, Bob and Pat Wilkinson, Alistair Broome, John Biggs from the Model T Register, Clare and James Ellingworth from The Capri Club and myself, Roger Corti, with a friend John Nutkins. 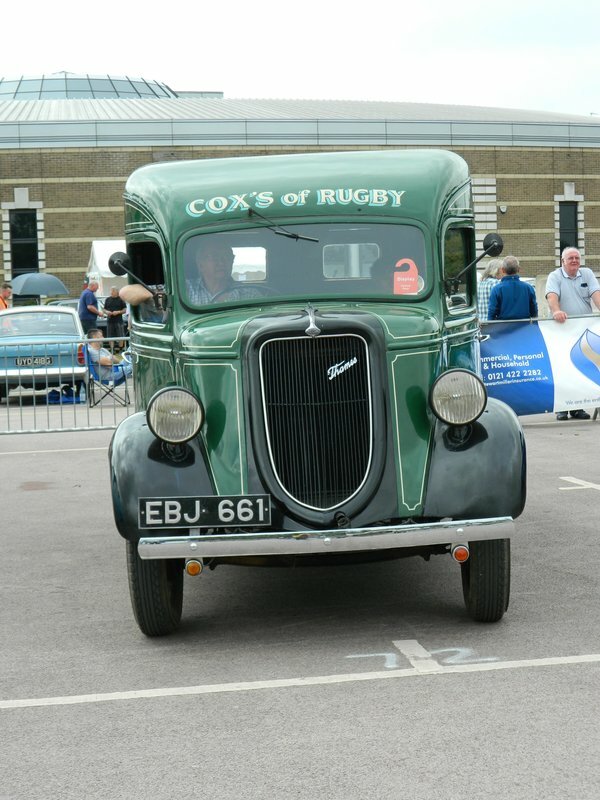 ​On the Sunday, everyone was up as early as possible to receive exhibitors from far and wide – all Fords were pre 1985 – and guide them to their allotted positions. Many members’ wives were in attendance, dressed up in the prettiest of period costumes, to give out the “Goody Bags” and programmes. 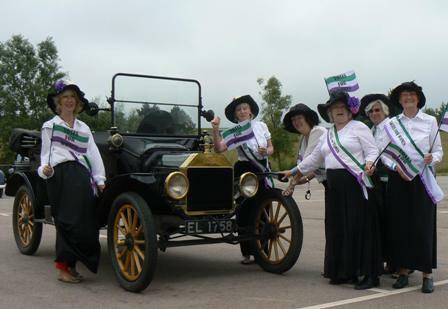 These ladies would later be celebrating 100 years of the suffragette movement in gaining votes for Women. 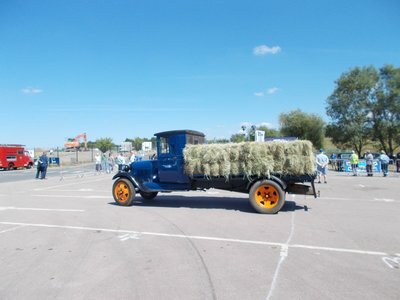 This they did in the arena, using several Model T’s to tour the extensive Heritage site in order to gain votes for their campaign. They then grouped together into the Y & C Suffragette Choir with an excellent and inspiring rendition of “Oh Dear, What can the matter be?” All very harmonious it must be said, but there was one incident of an interloper, dressed up with the suffragettes and getting a free ride on the T’s - soon revealed to be Mike Malyon, our Membership Officer, getting into the spirit of the occasion. Amongst other members attending on Sunday were Peter Purdy, Brian and Di Godfrey, Bob Brown, Roy Hocking, Mike and Christine Leete, Alan and Sheena Summons, Sam Roberts, Mike and Kath Samuel, Graham Miles, John Argent and Doug and Bessie Hickson. ​The numbers of exhibitors grew quickly, as well as visitors and their families, enjoying the day out and touring the museum. Getting the hundreds of exhibits - some on trailers as well as the larger transport lorries - down the entrance ramp without any major incidents was a reflection of the fine tuned organisation and skills of the members who had volunteered to direct traffic. It is reported that about 500 vehicles attended, mostly cars, with some commercials, tractors, odd military and “Unusuals”; the oldest entrant being a 1904 Model A. About 40% were pre-1960 making up the “Old” in the event’s name. Our members provided an outstanding collection of “Y”s and “C”s – some 25 in number. 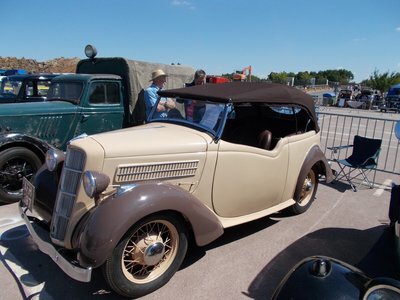 This varied from the untouched to the fully restored, two and four doors, plain and deluxe, tourers and specials all coming together for an impressive line up. 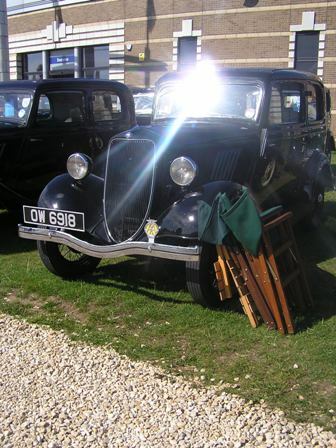 Variety was everywhere – including seven different types of luggage rack. Best commercial:- Tom Mansbridge with his 1952 Fordson ET6 breakdown truck. 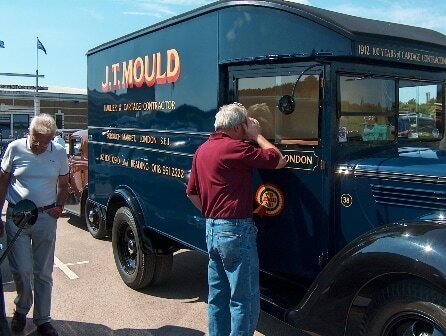 Runner-up commercial:- Rick Richardson with John Mould’s Model AA truck. 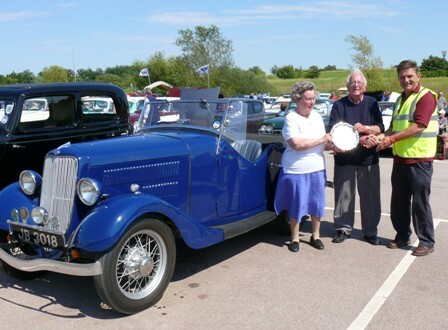 ​On the Y&C Register stand, Brian Godfrey, our Chairman, had much pleasure in awarding the Bert Thomas Trophy for the best in the Club showing to Peter and Jean Ketchell for their immaculate Model “CX” tourer. 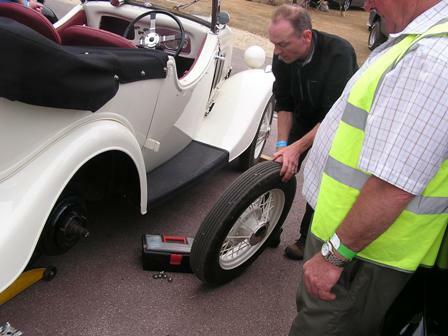 ​Some of us were educated by the removal of the rear offside wheel from Clive Harrison’s Tourer as its brakes had been binding. 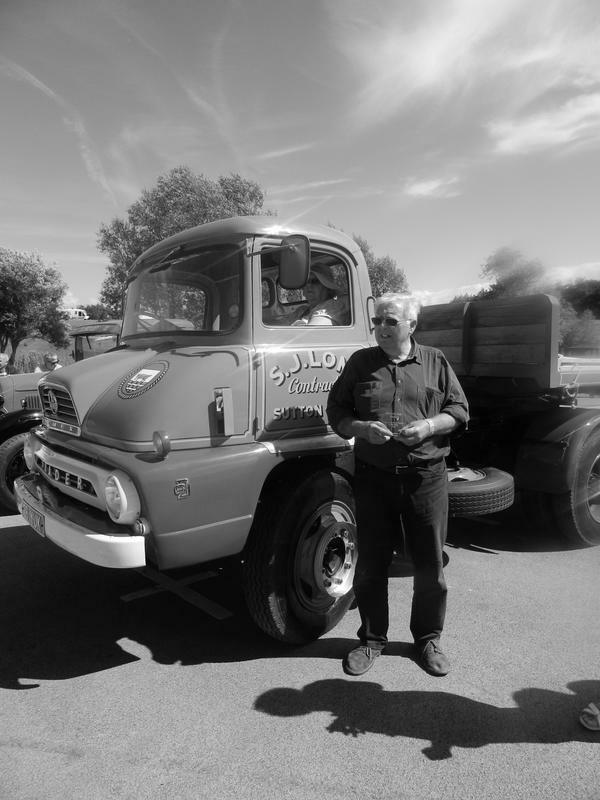 Roger Hanslip had helped with hub pullers and club hammer to reveal a damaged taper on the half shaft, causing the hub to move inwards on the axle, thus causing the drums to rub the brake shoe edges. Clive promptly went to the Autojumble and fortuitously acquired a ‘New Old Stock’ pair of half shafts to be fitted upon his return home. 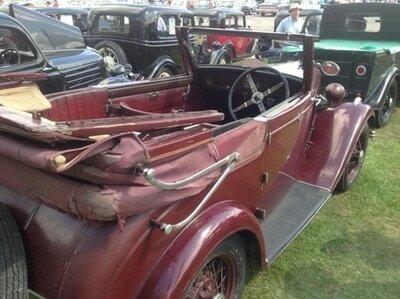 ​The Autojumble area provided many of us with a large range of spares and the best were soon snapped up. Club members were observed like bees round a honeypot. Amongst spares seen to be purchased were gearboxes, brake drums, brake rod bracket, Trico wiper motor, manifolds, original car jack, complete axles, half shafts, tie rod, Magnaflex round bars, and so much more – books, badges, gaskets, pictures and sundries. The Old Ford Rally had, as well as the display of fine old cars, provided the opportunity for many of us to renew friendships, remember and name faces, meet and greet newcomers and learn and share technical information as well as re-kindling enthusiasm to complete our projects. Sam Roberts attended as author of his new book with a sample to see or buy. 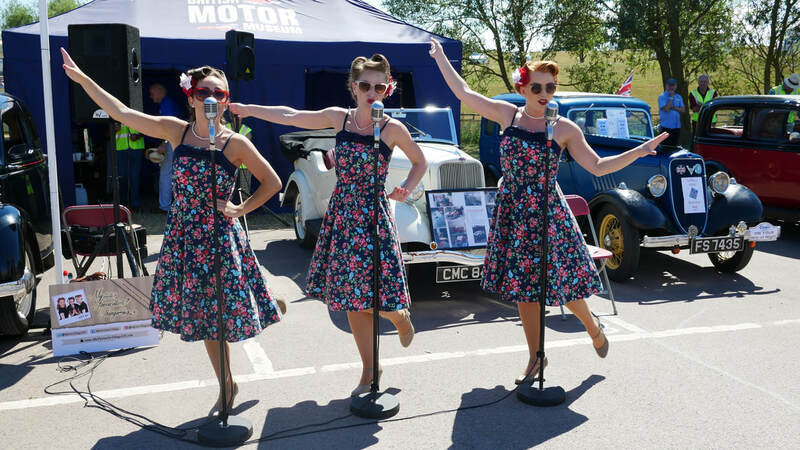 For the hundreds of visitors, they saw an unrivalled collection of old classic Fords – cars and commercials - in a very friendly setting, and at an exceptionally good entrance ticket value. 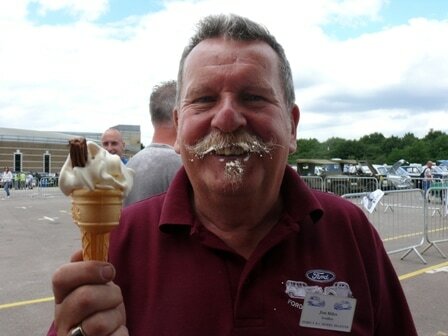 ​As Sam is away - playing golf would you believe – it’s down to me, Roger Corti, to report on the show of the year – that is the Gaydon Old Ford Rally. 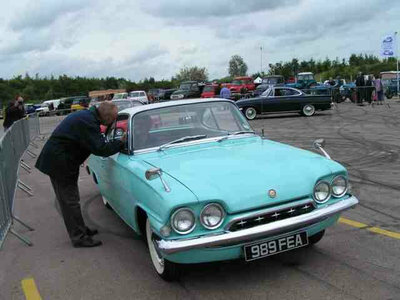 The show this year has seen the involvement of other car clubs in the organising (Ford Capri Int., FSOC, Ford Model T Register and ourselves, the Y & C Register.) so as to reduce the pressure on Bob Wilkinson and share the load with our Club. There had been much work in the preparation in the months leading up to the event, and it showed in the finesse with which it came together. On the Saturday, the site had been laid out , signs placed, barriers erected and everyone tasked with the plans for smooth running on the Sunday. 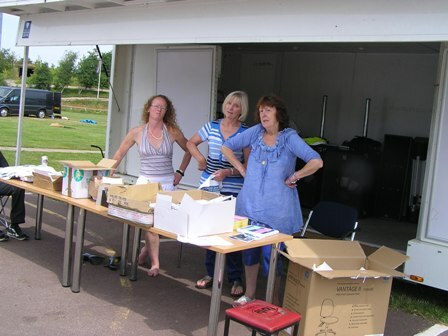 Keen and helpful wives had started on the Goody Bags – packing and rolling up the programmes, adverts & contents complete with voting slips. 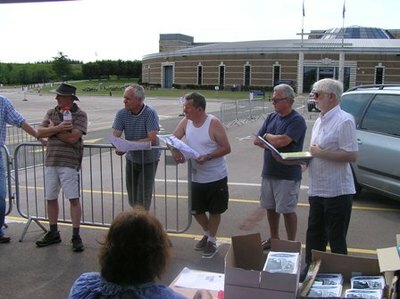 We all knew what we had been volunteered for by Bob’s 4 o’clock meeting – and to arrive at the crack of dawn on Sunday ready for the early arrivals & dealers. 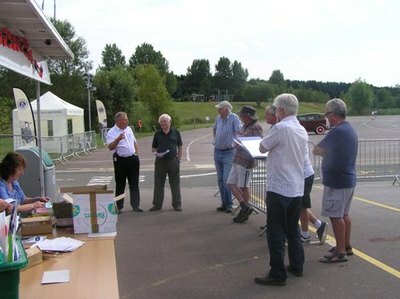 Mike Malyon, Jim Miles & myself took early positions at the gate to advise and assist in putting on the wrist bands, (not easy as three hands needed), others down the hill persuaded drivers to take up their correct positions as per Bob’s Map. Several wives handed out the goody bags, complete with naughty adverts and programmes. The Heritage Centre Staff took up security and gate positions and we were off. Apparent were several coloured duster twizzle sticks – I guess to tickle everyone into the right mood? 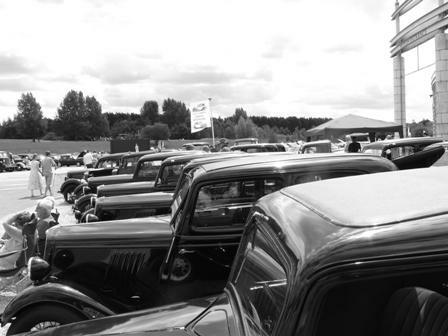 It was exciting to see all the range of elderly cars and commercials arriving – nearly all under their own steam – and being there to welcome them. 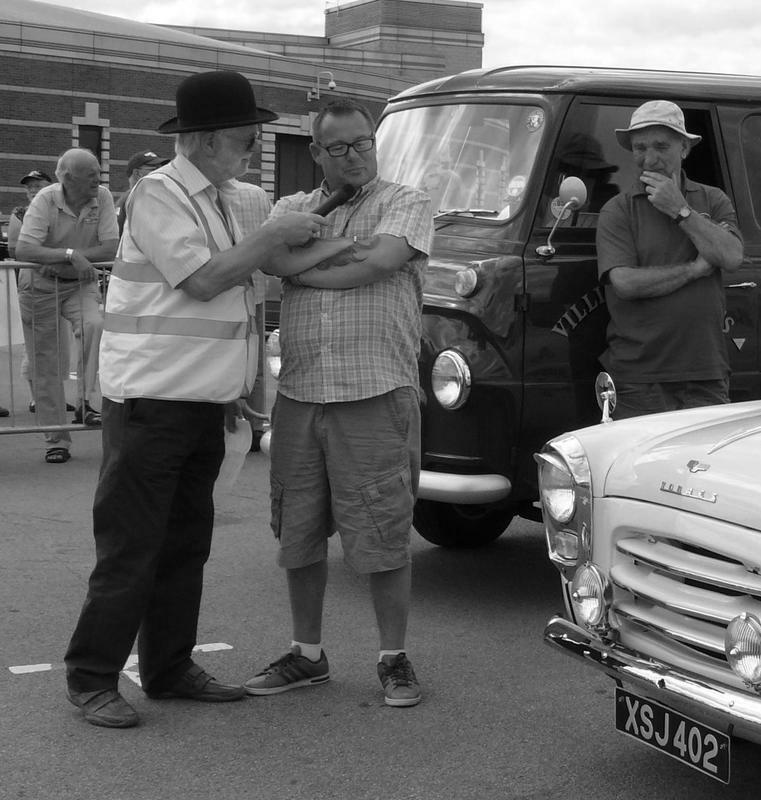 There were some 500 cars on display, from about twenty clubs, mostly pre-1965 with the oldest a 1911 Model T.
The event rolled on through the day, with many cars being featured in the Arena with Peter Purdy asking pertinent questions of their owners, and Bob announcing. The noticeable characteristic of the show was the friendliness of all – like a family gathering at a wedding I thought – all smiling and enjoying the company and the glorious weather and enjoying the company of old friends. 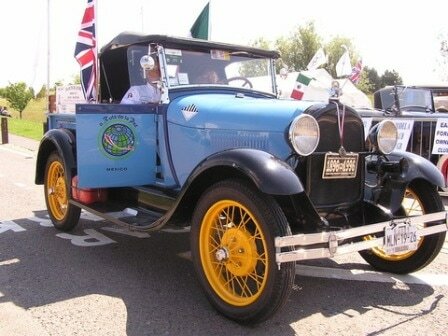 Later through the day, we were all excited when the 1928 Model A from Mexico arrived on its “5th Route of Peace”. It was en route to the Olympics, having visited the previous sites at Atlanta in 1996, Sidney in 2000, Athens in 2004, Beijing in 2008 and now London 2012. It had taken Dr Claudio Anaya and co-pilot Arq. Fernando Garcia Limon 10 years collecting the bits and 8 years restoring - and then was challenged by a friend who thought it wouldn’t even get to Mexico City - starting off these trips in response. 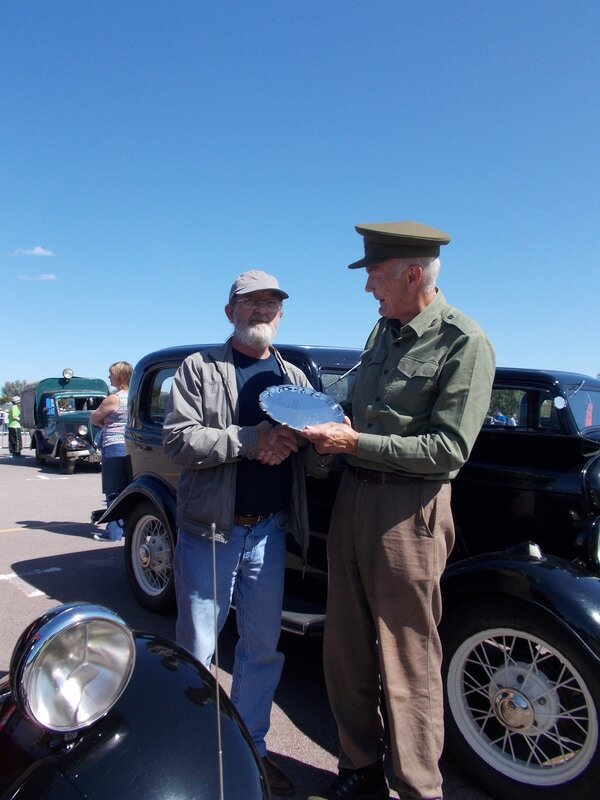 220 Peace medals were to be issued to participating countries and one was presented to Bob Wilkinson, and in return were given Club Caps, Model A Club Rad badge & Motoring Books from the Heritage Centre. 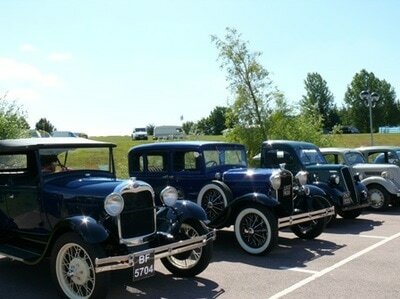 Everyone was worried when as the car arrived, hot water gushed from the engine – but with the help of the Model A club, glands were tightened in the water pump and all was soon well. In the afternoon, the winners were announced for the “Car of the Show” and the “Best Commercial” – chosen by the public who attended using voting slips in the programmes. The Car of the show was :-a 1964 Classic Capri Coupe driven by John Beckett and his son Paul. 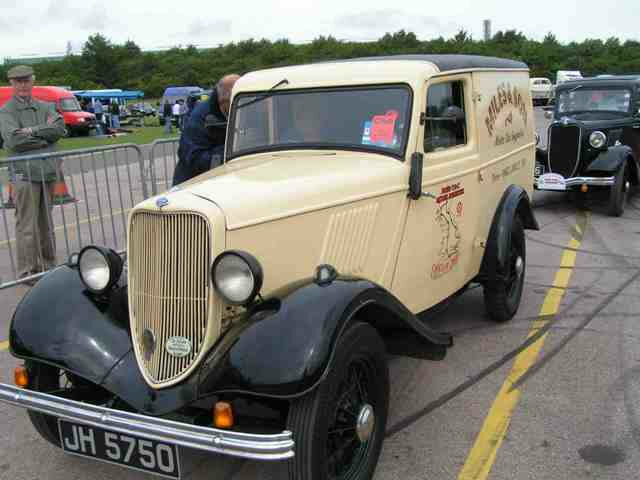 and the Best Commercial was a John Mould 1939 Fordson V8 Box Van Model 091T driven by Rick Richardson. 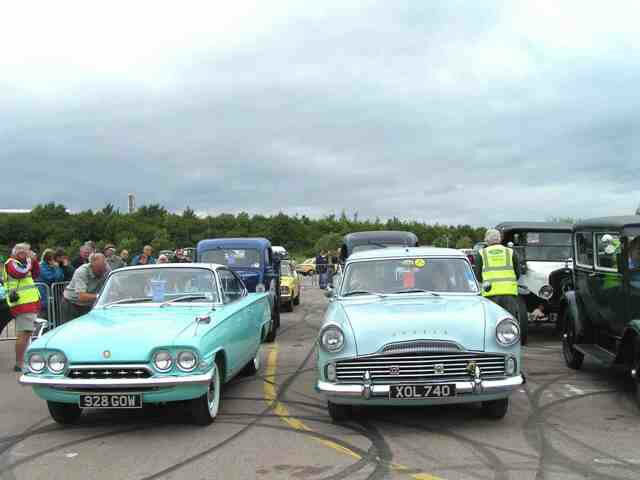 It was also the 50th anniversary of the Mk 3 Ford Zephyr and Ford Cortina – a large selection were on display - maybe the largest group of Zephyrs & Zodiacs around. It was thought about 2000 people attended the show. The Banbury Rotary Club held competitions to guess age and price of three Fords. 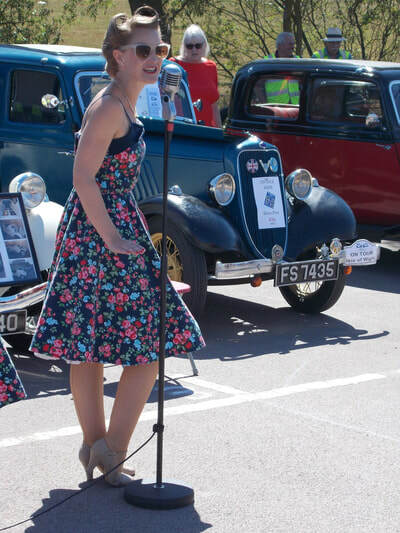 A Curio and Craft Fair was held indoors as well as the comprehensive and delightful Museum – excellent value all round. John Argent and myself had dynamo problems getting home, others, unnamed here, lost their keys and had to resort to piece of wire judiciously placed, but it’s believed that everyone who came got home safely. Amongst the 17 cars on display were FS 7435, JB 3018, JB 6552, OW 6918, DKE 912, COA 715, CNY 360, YD 8501, JL 4086, EMF 151, CNN 125, VE 9051, AOA 727, UD 7605, NV 2821, AYL 454, DKO 301. 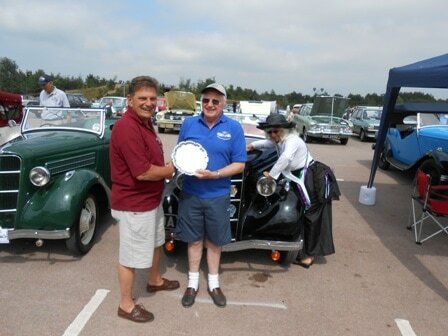 Doug Hickson’s Y Model Mistral Tourer won the club award presented by Chairman Brian Godfrey. Others attending and recalled were :- Brian Godfrey, John & Carol Argent, Bob & Pat Wilkinson, Peter & Joan Purdy, Mike & Elsie Malyon, Peter & Jean Ketchell, Colin & Christine Rowe, Jim & Jean Sharpe, Jim Miles, Graham Miles, John Keenan, Mike & Cathy Samuel, Geoff Salminen, Roger & Jo Hanslip, Nick & Monique Smith, Herbert Wingate, Tony Hurst, Doug Hickson, Dave Tanner, Nick Haul,Robert Jarvis and Colin French, Rod & Lucia Viveash, Gary & Vicky Whittle, Tom & Wendy Kelsey, Dave Paul, George Beecham, Graham & Margaret Dellow, Colin Ellis, Michael Leete, Geoff Dee - and the support of all those mentioned (and those not) is much appreciated by the organisers. 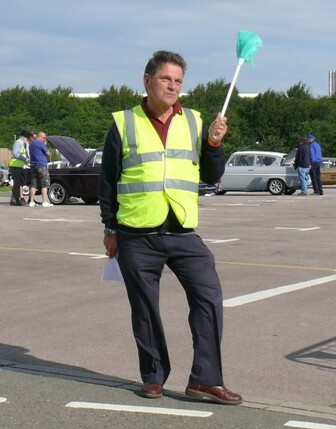 Brian Godfrey, our revered Chairman, directs traffic with his bright green twizzle stick - I think he should stick to the day job! 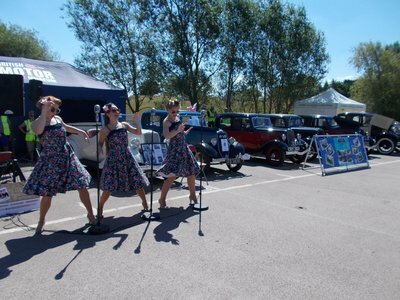 The Ford UK Centenary was celebrated in fine style at the Heritage Motor Centre, Gaydon on Sunday 24th. 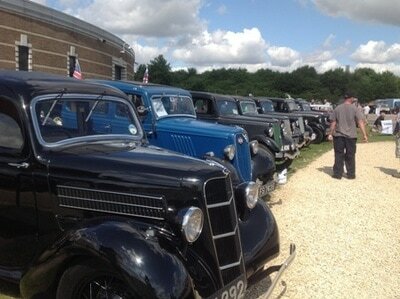 July when the annual Old Ford Rally became the biggest old Ford gathering of the year. 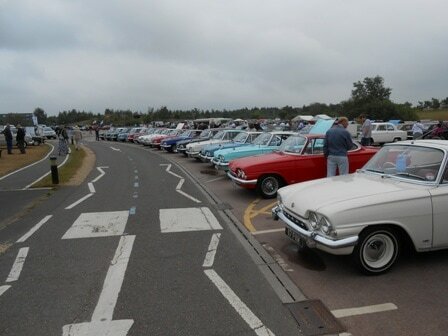 Over 450 Fords, to 1985, were on display. 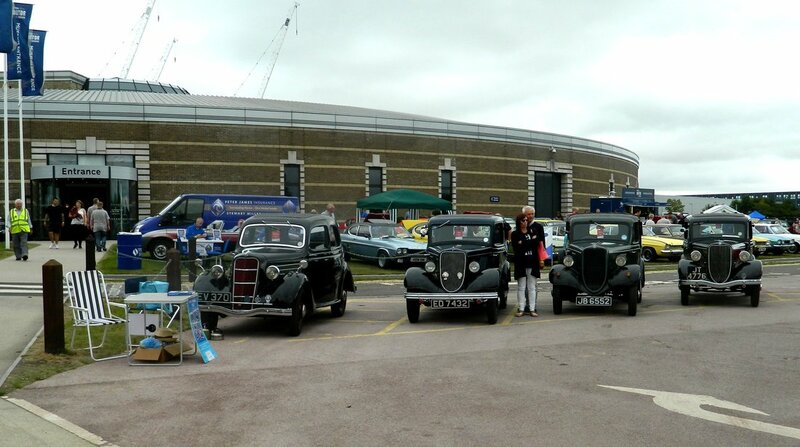 Virtually everything Ford UK had produced was on show with the Ford Motor Company taking centre stage with several vehicles from their Heritage Collection at Dagenham. 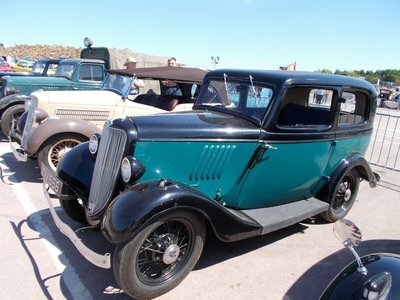 25 classic Ford Clubs were involved in presenting vehicles. The oldest vehicle, other than Ford’s 1896 Quadricycle (replica), was a 1903 Model A (Henry’s original Model A) with a Model T which was weeks short of being 100 years old. 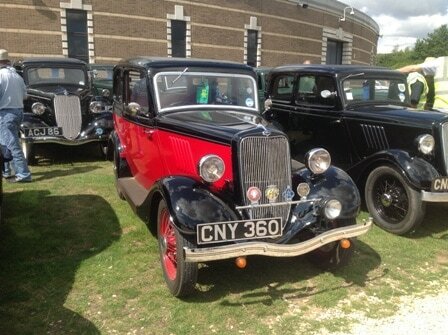 Model T’s galore rubbed shoulders with Model A’s of the 1920’s , V8’s , Model Y’s and other sidevalve Prefects and Populars of the austerity period were followed by the exotic Zephyr and Zodiac now incredibly 60 years of age. 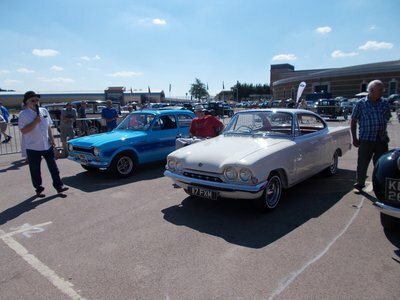 The Ford Classic and Capri celebrating the 50 years of sleek design turned out in force ...one for each birthday... their biggest gathering ever! Apart from the beautifully restored and several “original” cars on display, the crowds on a wonderful sunny day, were able to inspect a wide range of commercials, tractors and even jeeps. Traders did well too on the day judging by the amounts of interesting spares being taken away by keen buyers at the end of the day. 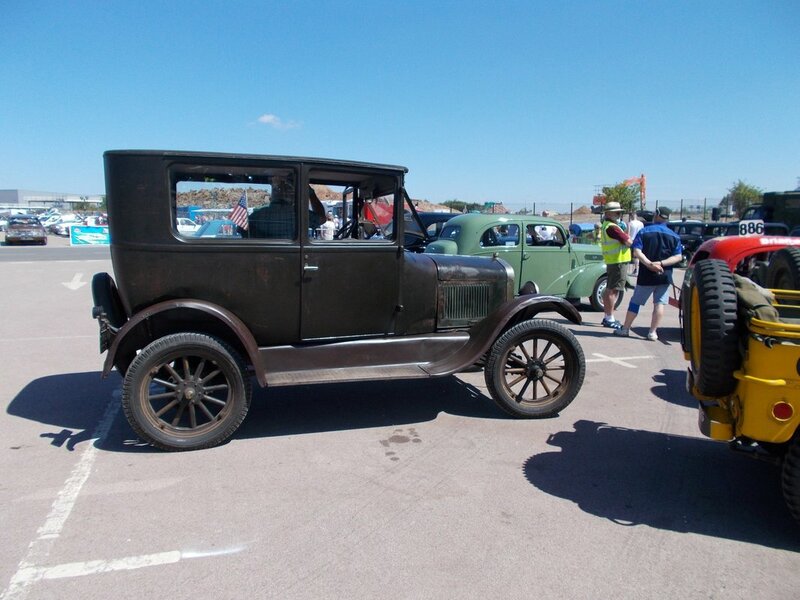 Banbury Rotary charity was able to benefit from the “Ride in an Old Ford for Charity” feature whereby the public could choose to ride in a range of cars, from a 1904 Model S , Model T’s and A’s to the relatively new Capri of the 1980’s and even a Thames Trader truck. 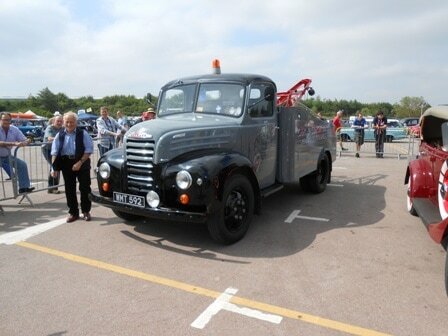 The Commercial Vehicle Award was won by a 1956 ET6 owned by Doug Allen from Herefordshire with the Car of the Show trophy , chosen by exhibitors, being a 105E Anglia owned by Richard Bingham from Northern Ireland. ​The Ford Y & C Model Register Show organiser, Bob Wilkinson said, “We were delighted by being able to put on a wonderful range of Fords covering the century thanks to the magnificent support from clubs and individual entrants. 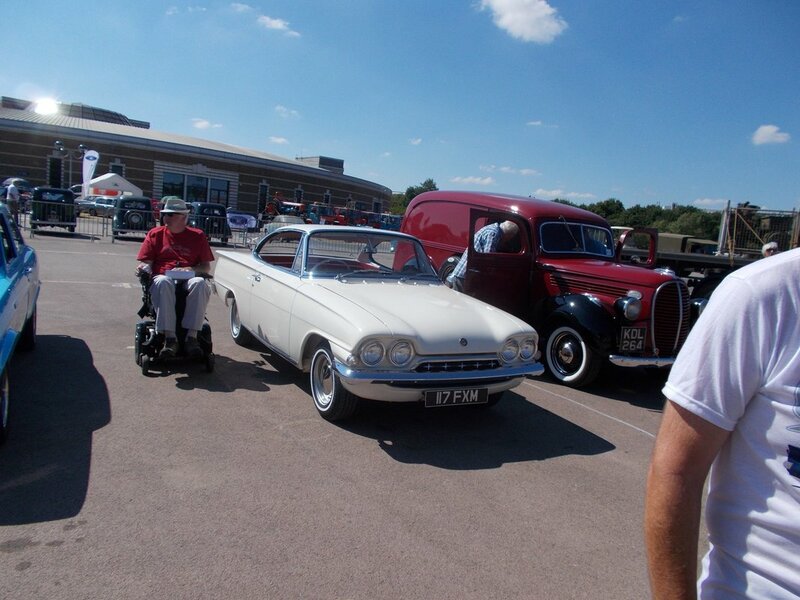 Gaydon show facilities are second to none and readily accessible in central England. 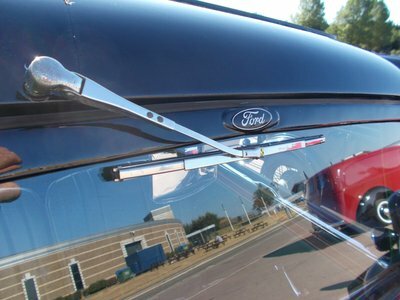 An important feature of the show was the good balance between old and newer Fords exhibited. 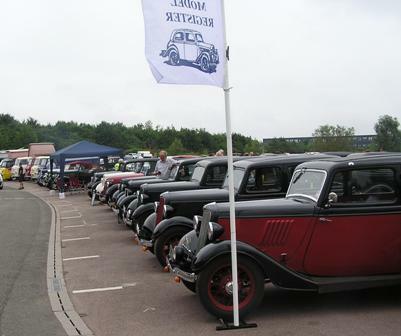 We had enthusiasts attending from all over the UK and even Denmark and Holland too with everyone going home looking forward to next year’s Old Ford Rally”. ​​The second Old Ford Rally held at the Motor Heritage Centre, Gaydon, was enjoyed by entrants and public alike and declared a success. 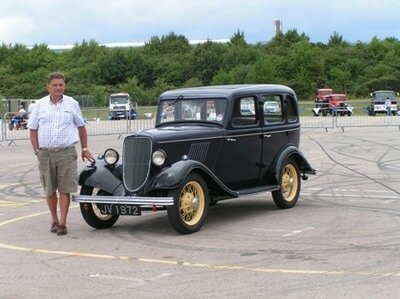 A visitor to the show emailed me with the comment that “it was great to be part of a proper classic Ford show”. 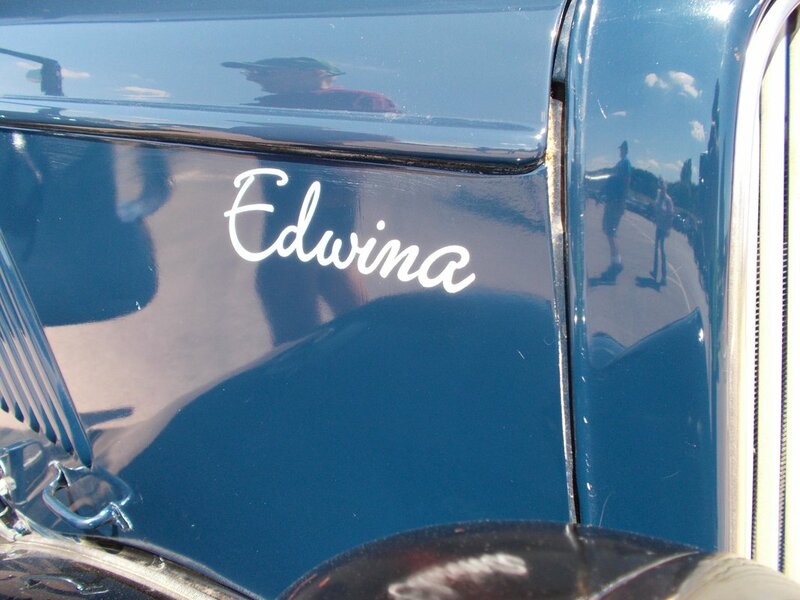 What he added was that so many shows rarely feature cars from the pre-1940 era and our show was an exception. We had over 350 old Fords on display with almost 100 being pre-1940 with everything from Model T’s, Model A’s , our Y&C’s and early V8’s . 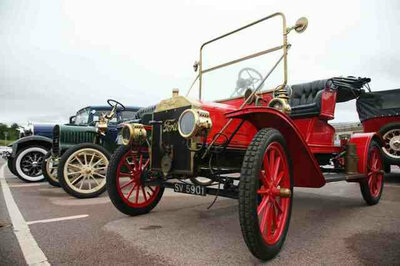 It is rare to find a pre – 1910 cars at shows ......we had 3 on display. Not just on display but being driven around the parade arena ! 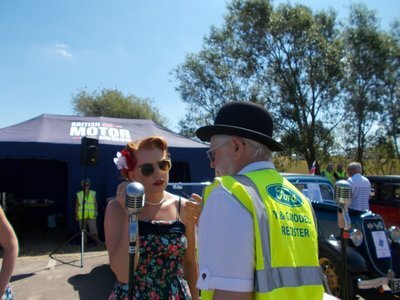 Member Barry Nutley, a professional commentator, did a splendid job on the mike interviewing entrants who were often very modest about their restorations etc. as they took part in arena parades. Following on we had the Pilots, upright Anglias & Populars and the ground breaking 5 Graces – the Prefect, Anglia, Consuls, Zephyrs and mouth watering Zodiacs we remember from to 1950’s. The Lotus Cortina stand had a splendid display of beautifully restored cars showing Ford’s sporting side with the Capri range being the newest eligible cars. On the commercial side we had tractors of all ages, 400E’s which were very refined for the era and the everlasting Transit. The handful of heavy commercials had been restored to a magnificent standard. 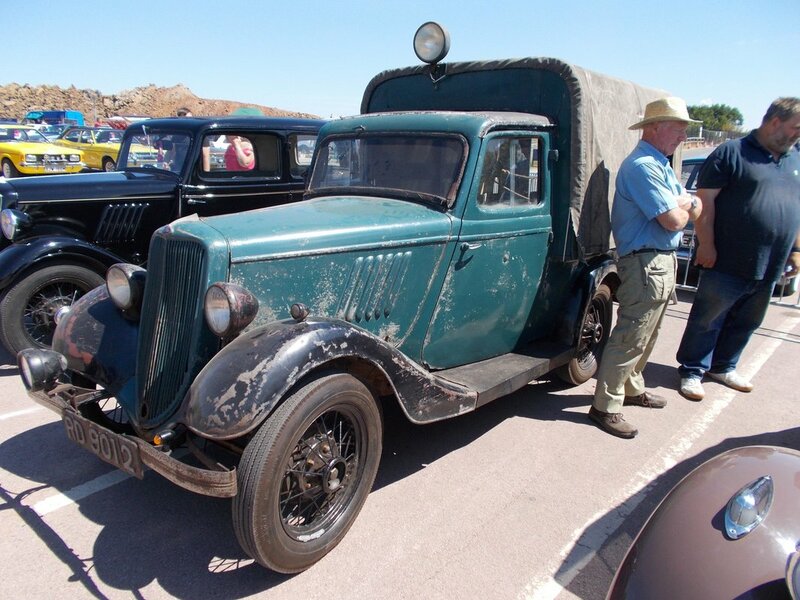 The “Ride in an Old Ford for Charity” feature was popular with the public doing just that in a range of vehicles from Model T’s to Capri’s with even a 7 ton Thames lorry and ....a Ford Pilot hearse taking visitors on a return journey! 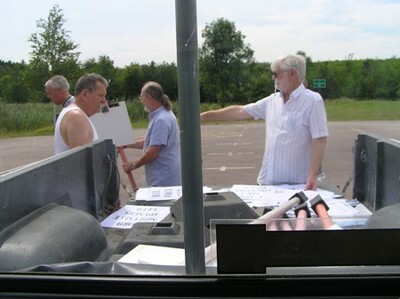 Banbury branch of Rotary marshalled this feature with enthusiasm and benefited from donations. 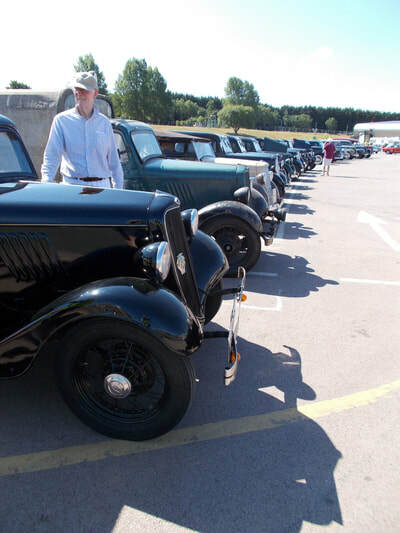 The important aspect being to note how many young visitors rode in older Fords...hopefully they will become the next generation of classic car owners. 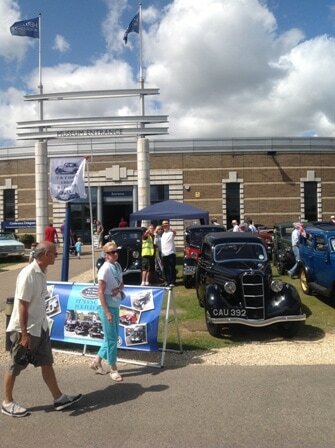 The trade stands were busy too and site visitors were able to escape the heat of the day browsing the excellent collection of cars in the Heritage Museum. 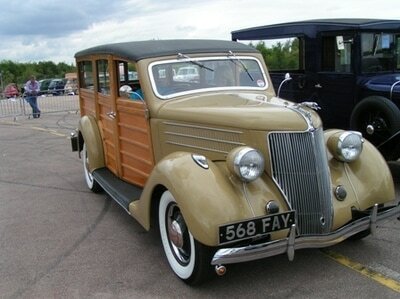 The overall Car of the Show was a beautifully restored 1936 Model 68 V8 Woody owned by Colin Peck. 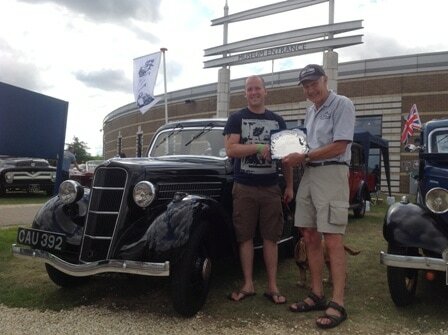 Brian Godfrey won the Y&C club car of the show with his newly restored 1933 Model Y and proudly accepted the Bert Thomas Trophy. Thanks to all our members who displayed cars and a big thank you to members and wives who gave generously of their time to marshal the show. If you missed it this year ....make sure that does not happen next year! A superb range of Ford vehicles numbering around 350 were exhibited at the first Old Ford Rally at the Motor Heritage Centre at Gaydon in Warwickshire. 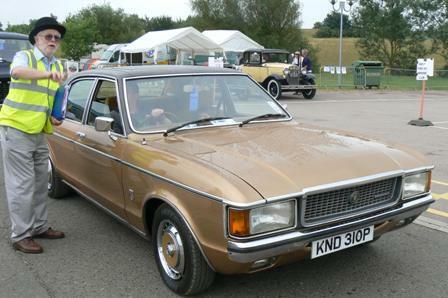 The show was aimed at pre- 1983 Fords and on show there were examples of virtually every UK produced Ford model. Apart from exhibitor cars, visitors were able to take advantage of the arena parades, outstanding museum facilities, Ford related gallery displays, film shows and an autojumble. 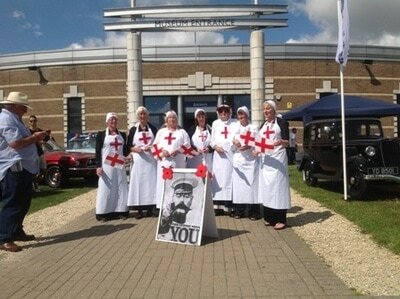 BEN charity marshals were kept busy with “Ride in an Old Ford” feature. Through the day over 20 Fords from Model T’s, A’s through to Zephyrs and Capris were available for public rides. Apart from raising money for this motor industry charity this activity gave the opportunity for the next generation of classic car owners to get a taste of old style motoring. There were 4 pre-1910 cars in the line-up; a 1904 Model A, 1904 Model C and 2 1908 Model S Runabouts which set the scene for the world renowned Model T. Cars dominated but commercials and tractors were on display. About half the vehicles at the show were pre-1955 to give a good balance of older and newer Fords. Picking the best on view was extremely difficult but a 1957 Ford E83W pickup, belonging to Patrick Russell of Witney, took the “Car of the Show Award”. This had been rescued from a scapyard some years ago and beautifully restored by the owner. 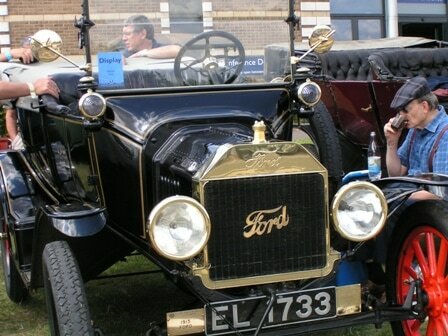 Bob Wilkinson, Secretary of show sponsors Ford Y & C Model Register, said ”This first Old Ford Rally has been a great success for all concerned and will become a regular feature on the classic car calendar. Those who missed this will doubtless wish to be here in future years".